Isn't it obvious that if we set out to design the most perverse, toxic and doomed system possible, we'd end up with the Keynesian Cargo Cult's insane permanent growth/Landfill Economy? Few topics are off-limits nowadays: the personal and private are now splashed everywhere for all to see. One topic is still taboo: the holiday's perverse incentives to over-consume and over-spend,lest our economy implode. This topic is taboo because it strikes at the very heart of our socio-economic system, which is fundamentally based on permanent growth, the faster the better, as if unlimited expansion on a finite planet is not just possible, but desirable. In the current Mode of Production, the solution to every social and economic ill is to "grow our way out of it." The solution to unemployment: jump-start growth by expanding consumption, spending and borrowing. The solution to stagnant wages: jump-start growth. The solution to declining profits: jump-start growth. The solution to government deficit spending: jump-start growth. So what happens when most people have not just the basics of life, but a surplus of stuff? Where is the growth going to come from if people already have everything? 1. Replace a perfectly good product with a new product and dump the old one in the landfill. 2. Buy duplicates and put the surplus products in the closet or storage facility. 3. Buy gimmicks (Pet Rocks, etc.) that are tossed in the dump shortly after the holiday gift-giving season ends. But does this Landfill Economy make sense? The cheap oil is about gone, and so does it make any rational sense to burn the last of the cheap fossil fuels on assembling stuff nobody needs in China, shipping it thousands of miles to retailers or Amazon warehouses, adding it to the immense piles of stuff most households already own, and then shipping the old but still functional products to the landfill, just to keep the economy humming? This is of course insane. Decisions aren't being made as if scarcity matters; the goals and incentives are set to encourage perverse and destructive overconsumption and overspending: not only are we squandering resources in the sacrifice to the false gods of "growth," we're indebting households to do so, stripping income that could have been saved and invested in productive uses. 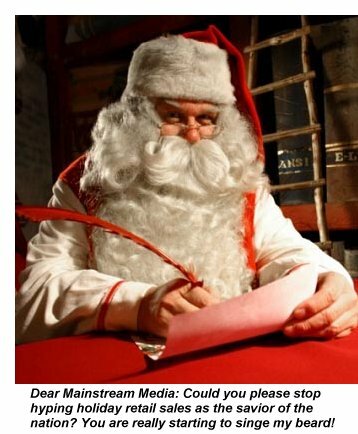 In the lunatic asylum of the current economic model, media anchors sport grins of delirious joy when reporting increases in holiday spending, as if a bump higher from $680 billion to $700 billion is a gargantuan win for the flailing economy. Wasting resources, capital and income on stuff nobody really needs is a monumental disaster on multiple fronts. Rather than establish incentives to conserve and invest wisely, our system glorifies waste and the destruction of income and capital, as if burning time, capital, resources and wealth on stuff nobody needs is strengthening the economy. Isn't it obvious that this system is a one-way path to collapse? Isn't it obvious that burning resources and capital to haul stuff to the landfill at an ever-increasing rate is madness, folly, recklessness and stupidity combined? It doesn't have to be this way. I've sketched out a sustainable, human-scale Mode of Production/way of living in my two books, Money and Work Unchained and A Radically Beneficial World. A new arrangement is inevitable. Our choice boils down to changing our understanding and Mode of Production now, before the whole perverse structure falls apart, or waiting for scarcities and self-serving systems to collapse the current arrangement, leaving the ill-prepared and shell-shocked populace to sift through the wreckage. Common sense suggests the first option is the wiser choice, but common sense is scarce in a world trapped in a bizarre Keynesian madness. Thank you, Metal Roof Estimating ($25), for your superbly generous contribution to this site-- I am greatly honored by your support and readership.